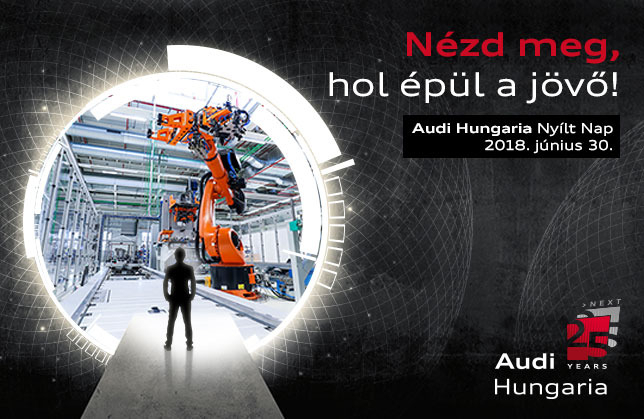 On 30 June 2018, 25-year-old Audi Hungaria will open its doors to the public again. On the Open Day anyone can get a behind-the-scenes glimpse at one of the biggest engine factories and state-of-the-art car factories of the world. Come and see where the future is being built! A mobile app, which contains exciting and useful information even before the event, also helps visitors in exploring the factory area. Download the app and play with us between 5-24 June in a treasure hunt, where augmented reality (AR) gives a special thrill. 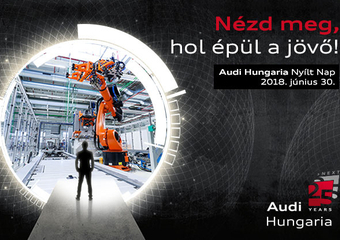 The expedition continues on 30 June at Audi Hungaria. The app makes the Open Day even more exciting by detailed programme information, interactive map and AR contents. Find the 25-year Audi Hungaria app in App Store and Google Play by 5 June! You can download the Mobile App from this Link. Our colleagues await the visitors with exciting and varied programmes at the factory area. At our experience points you may not only gain an insight into the everyday life of Audi Hungaria but you may have a first-hand experience of the operation of our company through interactive tasks and games. Explore the production lines of the three-, four-, five-, six-, eight- and ten-cylinder engines. At our experience points you can learn about our product portfolio, production processes and latest technology, you will have the opportunity to examine the most important parts and the interior of the machining equipment. The engine logistics unit will show their fleet and innovative solutions. At the quality assurance points you can get an insight into the latest examination methods. Get to know the behind-the-scenes secrets of vehicle production! At the vehicle factory’s experience points you can familiarize with the complete procedure of vehicle production from cutting the first steel plate till issuing the completed car. Through interactive tasks you can test yourself as a vehicle assembler, operator of a massive crane or as a Picasso of car bodies. You can test not only our cars but your senses during the presentations of the quality assurance. Get to know the smart solutions of vehicle production and the innovative tools of vehicle logistics! Learn everything about tool manufacturing. Press a jubilee memory key ring for yourself, learn which body components are built in Győr for exclusive series models. Gain an insight into the exciting world of device production. Training is the key of future. Get to know the latest methods and tools of training and vocational training. Explore the training centre of Audi Hungaria and test your knowledge! For those visitors who cannot choose one out of the several programmes, we prepare suggested itineraries, which our mobile app will guide you through while providing you with entertaining information and extra curiosities. You can choose from three itineraries. We offer two itineraries in the engine factory, one to get you familiarized the four- and six-cylinder engines’ production line and one to guide you through the production hall of the five-, eight- and ten-cylinder engines. By following our third itinerary, you will have the chance to see the whole procedure of vehicle production from press plant till vehicle assembly. Suggested itineraries can always be interrupted or combined with the programmes of experience points. We await our visitors who seek some rest with diverse framework programmes. Do some workout or visit the historical car exhibition of Audi Hungaria. For the little ones, we prepare with children programmes, inflatable castle and face painting. Come and see where the future is built! Please note that, during the event photos and videos will be made. If you attend the event, you will contribute to their data management. You can see more information about the data management of photos and videos on this Link.